Mumbai, India, was struck by protests after a disruption in railway services during morning rush-hour stranded thousands of office-goers. The anger got out of control, with stones pelted at officers and three vehicles, including a police van, torched. A technical glitch in the pantograph of a train near Thakurli station near Mumbai halted all central rail suburban services, report Indian press. 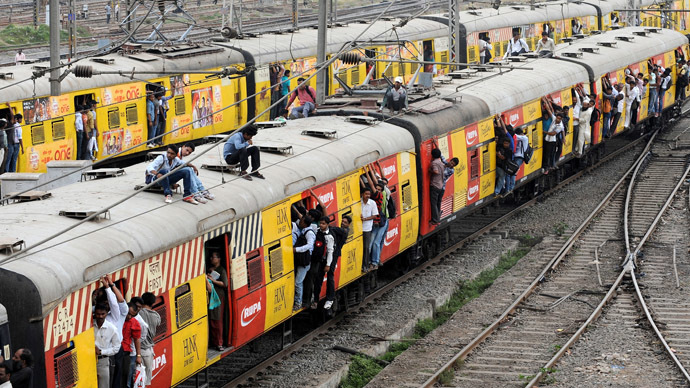 Over 5 million people use the central railway every day to get to work. Angry people rushed to the rail tracks between Diva and Mumbra, both Mumbai suburbs, bringing services to a standstill. "It is frustrating as I am already an hour late to work. And with the trains running packed, we are being majorly inconvenienced," an IT professional told the Times of India. Police tried to remove the protestors from the rails, striking the crowd with sticks. But people started throwing stones at officers. Some commuters managed to smash ticket machines on railway. “The commuters have occupied all four lines between Diva and Mumbra since morning 8.30am. We are not able to operate the services because of it. There was power supply problem in morning but it is restored now,” said Mukesh Nigam, divisional railway manager in Mumbai division. According to locals, Thane, Kalyan and Dombvili stations were the worst affected as there a large number of people board to reach their offices. Discussed the matter with Minister Suresh Prabhu. We will look into the reasons of disruption &work on corrective course for future. The protestors torched three vehicles, including a police van. “Following the stone pelting, locals set at least three vehicles on fire, which made Thane police resort to lathicharge to bring the situation in control,” a Government Railway Police (GRP) officer told Hindustan Times. According to reports from the Indian press, three motormen received injuries. All of the train drivers refused to work under such conditions. Later they called off their strike. Sources say that trains are now functioning 20 minutes to half an hour behind schedule. Chief Minister Devendra Fadnavis said on Twitter that he asked officials to ensure law and order at the stations. “Very unfortunate for commuters to suffer on Central Rail. Directed GM to sort out the grievances ASAP. Diva to CST feasibility studied now,” Railway Minister of India, Suresh Prabhu tweeted.